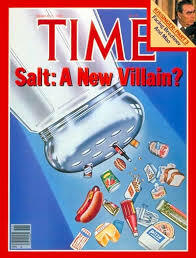 By 1982, salt was called ‘A New Villain’ on the cover of TIME magazine. The 1988 publication of the INTERSALT study seemed to seal the deal. This massive study involved 52 centers in 32 countries and laboriously measured salt intake and compared this to blood pressure. Across all populations, the higher the salt consumption, the higher the blood pressure. Seemed like a slam dunk, although the effect was quite small. A 59% reduction in sodium intake would be predicted to lower the blood pressure by only 2 mmHG. If your systolic blood pressure was 140, severely restricting your salt could lower that to 138. However, no data existed as to whether this would translate into less heart attacks and strokes. But based on this influential study, in 1994 the mandatory Nutrition Facts Label proclaimed that Americans should only eat 2,400 mg per day (about one teaspoon of salt). Yet the stubborn fact remains that virtually every healthy population in the world eats salt at levels far above that recommendation. The dramatic improvements in health and lifespan of the last 50 years have occurred during a period where almost everybody was considered to be eating too much salt. Our belief in the benefits of low salt consumption are largely based on mis-information and myth-information. The underlying assumption of the salt reduction advice is that eating too much salt is a recent phenomenon brought on by the increased consumption of processed foods. Dahl, for example, claimed in his writings that widespread use of salt as a condiment was uncommon until modern times. Data from military archives going back to the war of 1812 show that soldiers and presumable the rest of Western society ate between 16 and 20 grams of salt per day. During the war of 1812, soldiers maintained a daily consumption of 18g/ day despite high cost. American prisoners of war complained bitterly that their 9 g/day of salt was ‘scanty and meager’. It was only after World War II, when refrigeration replaced salting as the primary means of preserving food that Americans lowered their average salt intake to 9g/ day where it has remained since. During that period pre-WWII, there was no concern of excess deaths from heart disease, stroke or kidney disease – the main things used to scare us into lowering our salt intake. From its very inception, there were problems with the hypothesis that lowering salt could save lives. Dahl failed to notice all the various high-salt eating cultures that had no adverse health consequences. The Samburu warriors, consume close to two teaspoons of salt per day even going as far as eating salt directly from the salt licks meant for their cattle. Despite eating all this salt, the average blood pressure is just 106/72 mmHg and does not rise with age. In comparison, about one-third of the adult population in America is hypertensive with a blood pressure of at least 140/90 mmHg or higher. For reference, a normal blood pressure is less than 120/80 mmHg and generally rises with age in the United States.Villagers from Kotyang, Nepal, eat two teaspoons of salt per day, and the Kuna Indians eat one and a half teaspoons of salt per day, with no hypertension words, clearly contradicting Dahl’s hypothesis that a high-salt diet causes hypertension. The most recent survey of global salt intake shows that no area of the world conformed to either the AHA or the WHO recommendations for salt restriction. The central Asian region had the highest salt intake, followed closely by high income Asia Pacific region including Japan and Singapore. The Japanese diet is notoriously high in sodium with copious use of soy sauce, miso and pickled vegetables. The Japanese themselves seem to suffer no ill effect as they have the world’s longest life expectancy at 83.7 years. Singapore is third in life expectancy at 83.1 years. If eating salt was really so bad for health, how could the world’s longest lived people also eat one of the world’s saltiest diets? The concerns of a low salt diet started in 1973, when an analysis found six where the average blood pressure was low despite a high-salt diet. For example, the Okayuma, consumed more salt than most nations today (up to 3 1/3 tsp per day), and yet had some of the lowest average blood pressures in the world. In some cases, blood pressure actually decreased as salt intake increased. For example, North Indians consumed an,average salt intake of 2 ½ tsp per day (14 grams) or but maintained a normal blood pressure of 133/81 mmHg. In South India, average salt intake was about half that of North India, but the average blood pressure was significantly higher at 141/88 mmHg. But there was still the question of the massive INTERSALT study. Further analysis of the data began to paint a significantly different picture of salt. 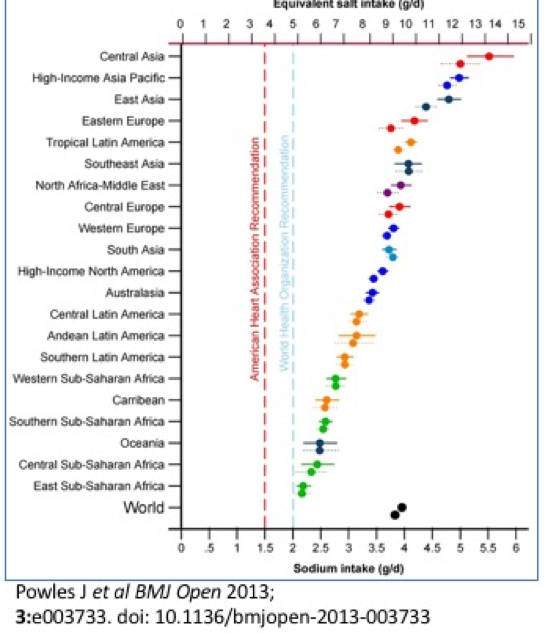 Four primitive populations (the Yanomamo, Xingu, the Papua New Guinean, and the Kenyan) had been included in the initial analysis, which had significantly lower sodium intakes than the rest of the world. They lived a vastly different, primitive lifestyle from the others, and one had a sodium intake 99% lower than the rest. These outliers had limited generalizability to the rest of the world and because they were such outliers, had an outsized effect on the averages. These 4 primitive societies differed from modern ones in far more than just diet. For example, the Yanomamo Indians of Brazil still live traditionally, hunting and gathering just as they had done centuries ago. They practice endocannibalism, where the ashes of loved ones are consumed because they believe it keeps them alive. There is no processed foods. There is no modern medicine. Comparing this tribe living in the forests of the Amazon to a modern American in the forests of New York is hardly fair. Isolating a single component of their diet, sodium and proclaiming it to be solely responsible for high blood pressure is the height of bad research. It is no different than concluding that wearing loincloths lowers your blood pressure. There were other issues, too. Two populations (Yanomamo and Xingu Indians), when studied further, had the near absence of a specific gene D/D of the angiotensin converting enzyme, which put these populations at extremely low risk of heart disease and hypertension. Thus, low sodium intake may not be the major or even minor contributor to low blood pressure in these groups. 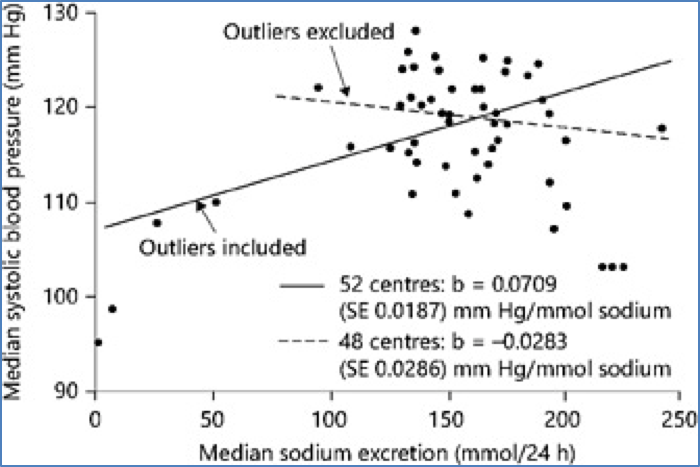 In this case, more information can be gained by removing these outliers from the study populations and seeing if the original salt hypothesis holds true. When those four primitive populations were removed and forty-eight Westernized populations were left in the study, the results were completely opposite the original findings. Blood pressure actually decreased as salt intake increased. Eating less salt was not healthy, it was harmful. The evidence from the United States was not encouraging either. The National Health and Nutrition Examination Survey (NHANES) are large scale surveys of American dietary habits carried out periodically. The first survey found that those eating the least salt died at a rate 18% higher than those eating the most salt. This was a highly significant, and disturbing result. The second NHANES survey confirmed that a low salt diet was associated with a staggering 15.4% increased risk of death. Other trials found an increased risk of heart attacks of eating a low salt diet in treated hypertensive patients. Those were precisely the patients doctors had been recommending a low salt diet! After an exhaustive search of the medical literature, the IOM made several major conclusions. Although low salt diets could lower blood pressure, “Existing evidence, however, does not support either a positive or negative effect of lowering sodium intake to <2300 mg/d in terms of cardiovascular risk or mortality in the general population.”. 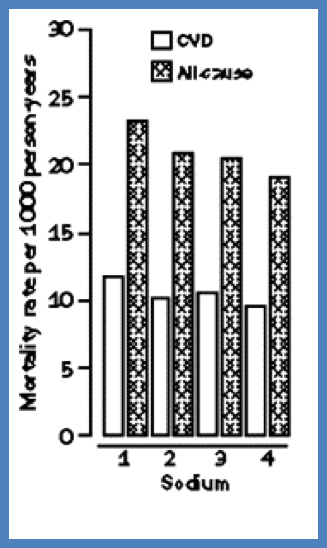 That is, lowering the salt intake did not reduce risk of heart attack or death. However, in heart failure, “The committee concluded that there is sufficient evidence to suggest a negative effect of low sodium intakes”. Oh my. The very patients we were most strenuously recommending to reduce their salt would be harmed the most. But dogma is hard to change. The 2015 Dietary Guidelines continues to recommend reducing sodium intake to less than 2,300 mg of sodium (about one teaspoon of salt) per day with a recommendation of no more than 1,500 mg of sodium (about two-thirds of a teaspoon of salt) per day in hypertensives, blacks, and middle-aged and older adults. Why is salt restriction dangerous? Salt is crucial to maintain an adequate blood volume and blood pressure ensuring that our tissues are perfused with the oxygen carrying blood and nutrients. Salt is composed of equal parts sodium and chloride. When we measure the electrolytes in the blood, salt (sodium and chloride) are by far and away the most common ions. For example, normal blood will contain sodium at a concentration of approximately 140 mmol/L, and chloride at 100 mmol/L, compared to potassium at 4 mmol/L and calcium at 2.2 mmol/L. No wonder we need salt so badly. There is speculation as to the evolutionary reasons why our blood evolved to be mostly salt. Some believe that we evolved from single celled organisms in the ancient seas of the Earth. As we developed multicellularity and moved onto land, we needed to carry some of the ocean with us as ‘salt water’ inside our veins and hence salt comprises the vast majority of the electrolytes of the blood. Salt is vital, not a villain. When I am on IF or EF, my blood pressure sometimes rises above normal and i experience heart palpitations. Is this related to the loss of sodium n chlorine that foms the major electrolytes in our body? It could be partly due to the raised adrenalin levels during a fast as well as low sodium, magnesium and potassium. Magnesium is especially important. Go on the web and look up how to make magnesium water. Magnesium is necessary for your musles to be able to relax and it also affects the walls of your arteries and veins, allowing them to relax. Low magnesium will also raise insulin resistance. I get an early morning headache every time I eat something sweet within a few hours of bed. It can be something as simple and seemingly innocent as a few grapes or fresh strawberries. Substitute a small piece of cheese; no headache. The zero sodium diet likely left her very deficient in magnesium as well. Very Low magnesium will definitely cause AF. Tell her to look up how to make magnesium water , also mention she might try magnesium oil as a transdermal method of increasing magnesium. A week at an ocean beach with a lot if time in the water will also raise magnesium levels as ocean water has a good deal of magnesium chloride in it. Very interesting. But the article leaves people with high bloodpressure in the dark about what they should do about it. A friend of mine is very thin, sporty and only 50 years old. He eats very healthy, lots of vegs, fruit, nuts, etc. Hardly any sugar, processed carbs. Still he suffers from a high bloodpressure. His still relatively young parents both had strokes some years ago and of course he is very afraid to be next. The GP tells him to either take medicin or reduce salt. He doesn’t want to take the medicine because of all the side effects. maybe that bit of sugar is too much for him. Quit ALL sugar no exceptions and even limit fruit to berries and lower glycemic. Also check if he has sleep apnea. Eating healthy often means low fat. High fat from butter, olive oil, fish, meat may actually be protective. Try it for a period and see what happens. I want to know if the low salt diet has caused this epidemic of dry eye diseases. I didn’t see where there were guidelines on how much salt we should be getting, only that the recommended <2300 was probably too low. I am extended fasting and feel that not getting enough salt is causing issues, in spite of drinking bone broth, and I would like to supplement but I'm not sure how high to go.